There are many causes of infertility issues that range from genetic factors to artificial causes. Women and men are both affected by this problem, though, in the past, it was entirely blamed on a woman. Different causes like stress, depression, hormonal changes and Polycystic Ovarian Disease syndrome lead to infertility. The high rate of smoking and alcohol abuse is not to be forgotten. Embryo transfer and so on. The best infertility treatment in Moga is offered by the fertility expert who has dedicated her time researching and partnering with other big infertility organizations to bring a change in the country and the world at large. 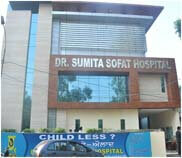 Dr. Sumita Sofat brings you the chance to try out the best treatments so that you get a bundle of joy in your family. The center handles all types of infertility issues and the best results are attained. Don’t wait for a long time; here is the best treatment for you.